Here’s Lea with her new chew toys. She is an absolute joy for our family but we didn’t realize how “big” of a joy she may eventually become! Our golden retrievers were more around 60-70 pounds. I attached an additional action shot because I think it communicates her level of energy. 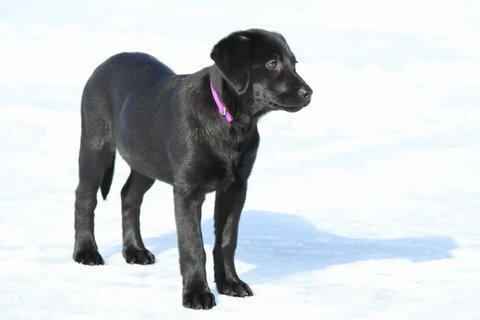 Just to let you know….we love our new puppy, we have named her Meredith and she is a joy to have around. 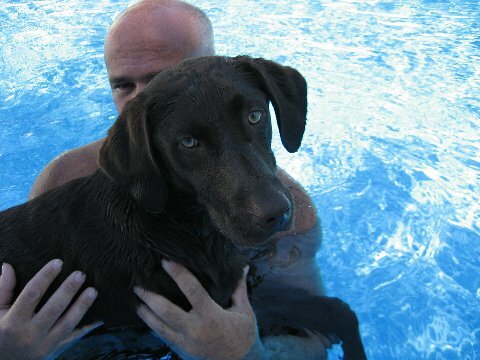 Our other Chocolate Lab, Mac, loves her too! 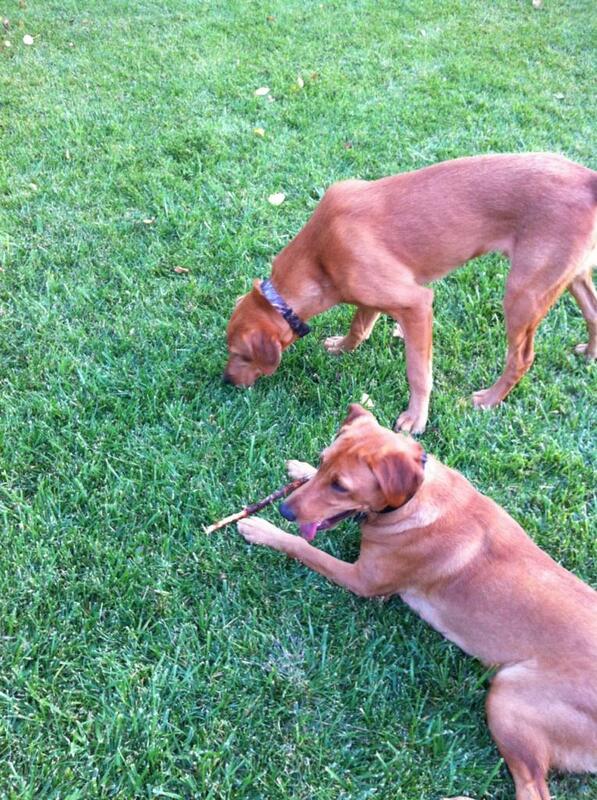 Attached is a picture of the two of them playing in there "yard". Thanks again, she is adorable. We are having such a great time with her. Alison & Family. instantly went on point!!! She is going to do very well hunting, I can't wait!! I sent some pictures of her pointing at 7 weeks which is very impressive!!! Just wanted to send you an update. Dexter is doing really good with us in Michigan. He's so smart, and responds well to the few commands we've managed to teach him like sit and come and we're working on down. He's a good walker too thanks to a trainer friend of mine. We happened upon a website, petshots.com (I think) with pics from a few litters ago and we just wanted to tell you what beautiful pups you produce. We get compliments all day long about Dex so we're always telling our friends and family where we got him :) Alex and I would LOVE to be on your testimonials page on the website so we will keep you posted. He's already 23 lbs!! Never having a dog before, I'm amazed at how fast he is growing. 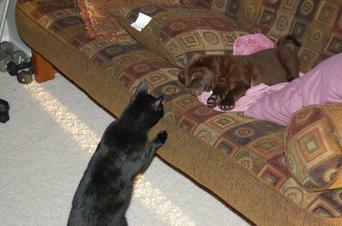 When you brought him, he could hardly reach the top of the couch, and today he pretty much jumped on it. We adore him and want to thank you and your family very much. Hi Chuck and Heather of Adventure Bound Gundogs, I have never purchased a dog from the Internet before but one day I was searching for labs and I was referred to Puppyfind.com I searched through (50) fifty pages and I found a pretty little face, she was a (8) eight week old chocolate Labrador retriever, my heart skipped a beat alright three (3) beats, I thought about her all night and the next day I e-mailed you about her . Within a few days we had solidified the deal and made arrangements for her to be delivered. I was very satisfied with the fact that you said you would hand deliver her to my door, because I did not want her to fly. When I saw her I was very pleased and I felt good about the fact that you wanted to see the home where she was going to be raised even though it wasn't stated. 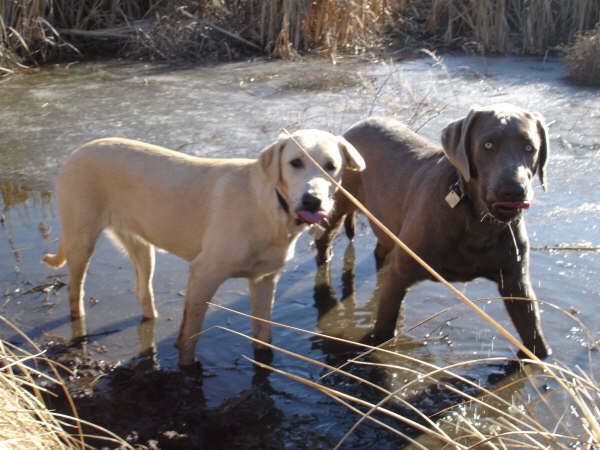 I have kept in touch with you since Jen's purchase and she is getting along just fine with me other two (2) labs Jack a 33 month old chocolate and Jill a 33 month old yellow lab. At first it was not easy with the adjustment but now they sleep together and sometimes eat together. I would recommend you kennel to anyone who is interested in purchasing a pet. I liked what you had to say in the write -up about Jen and I liked the people that I have come to know. Thank-You for Jen and if in the future I want another lab I will come back to you. 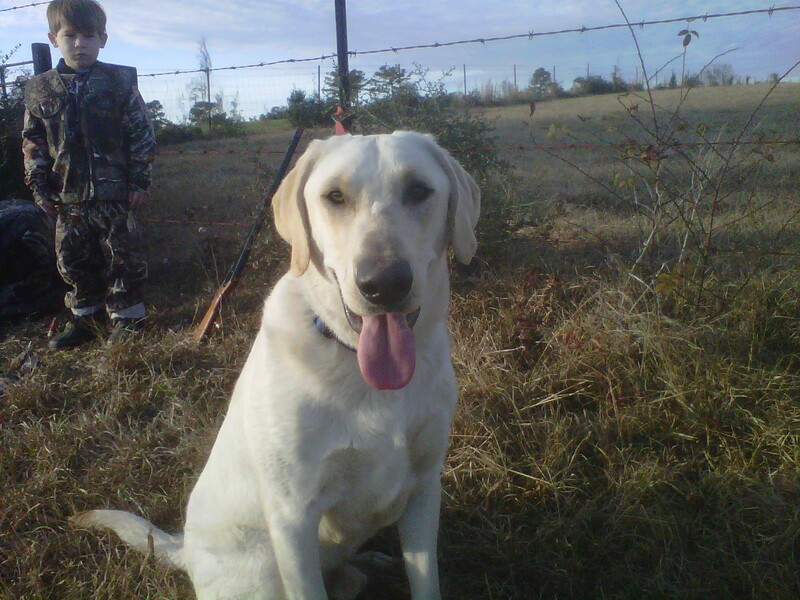 Here is Trip bird hunting on family property with his biggest fan keeping a close eye on him. The object on his nose is a dove feather!!!!! He is doing great and is a great dog. 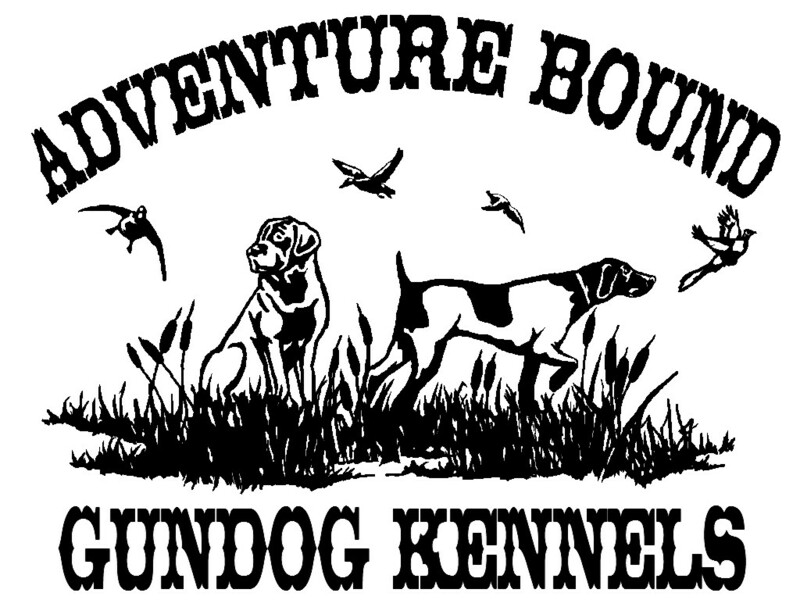 Thanks Adventure Bound Gun Dogs!!!!! First of all I would like to express my gratitude to you both,y'all have gone over and beyond in order for me to obtain my pup. I wanted to tell y'all that Cameaux is doing amazing! I have messed with some really good dogs but the sky is limit for this little guy. I have extremely high hopes for him. After I received him from Heather on Saturday I killed a couple of wood ducks and wanted to see how well he responded to them. I couldn't believe what I saw... a 7 week old puppy retrieving dead birds that early! 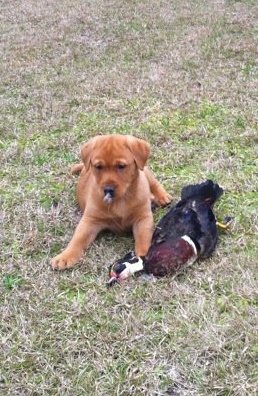 He is 9 weeks now and already has learned in two weeks to sit, kennel, and he is absolutely awesome at retrieving! I could not be more pleased with him. I wanted to tell y'all what an amazing business you both have created! I have referred several people already and will continue to do so. I also told them of the great care that you all take of the pups and the unbelievable delivery as well. I have attached some pictures and video of Cameaux. Thanks for everything guys! Greetings from Denise, Terry and our "PRECIOUS BABY GIRL" LOUISE, in Toledo Ohio. She turned 2yrs on Dec. 10,2010. She now weighs a very healthy 75 pounds. As you can see from the pics, she is Breath-taking beautiful. Smart as a whip, and such a lover. If we could breed her with a human, this world would be filled with kindness and compassion. She gets great exercise year round, loves to swim and long walks. We can't thank you enough for bringing her to us, and we recomend you folks to everyone. I could not choose pics, it was tough. I've lost count, we've got so many, and more to come. Oh yea, and a toy box that is out of this world. Thought you might like to see how big she's getting and good she is doing!! I've attached a link to a very short video and a photo for you!! I thought I would update you on my lovely Ember Lady. She's got about a dozen nick names. Em, Emmy, Momma, Ember, Miss Lady, Lady Girl, Ember Lady, Little Miss; she comes to all of them! She is a small girl, being only 55lbs and 19" at her shoulders. She only comes up to the knee of a person of average height. It's been three years almost since my little miss has come into my life. She's everything I need in a companion. sit, wait, no, come, and go back. She's an easy keeper. Very active girl but it's more endurance than outright energy. She is able to retrieve or swim or run etc all day if you want her too but she is just as content snuggled up in house. Her favorite activities are swimming, drives, retrieving, walks/runs, and snuggles. Em is an excellent companion. spayed in December last year. I go almost everywhere with her and she and my other companion Justus mean the world to me. I honestly don't know what I would do without her and I'm very very happy to have her in my life. Thank-you for bringing this fantastic dog into the world. Hi Heather this is Jayde and troy from bismarck. We got Rage from you a few days before Christmas. Rage is such a good boy and we have given your name numerous times. Rager is almost 6 months old now and is weighing about 56 lbs. We love him so much and he is very smart. He is a great addition to our family! Here are a few recent pics! For the longest time I wanted to send you some pictures of Murphy to show you how beautiful she is. She is always getting compliment's, what a gorgeous dog, she is so beautiful even her vet loves her. We don't know what we ever did without her, she is the best thing that ever happened to us. Thank you so much for this beautiful dog. Canyon turned 2 in September and is doing great! In February, we welcomed our son Hudson to the world and we were very concerned about Canyon adjusting with the baby home. 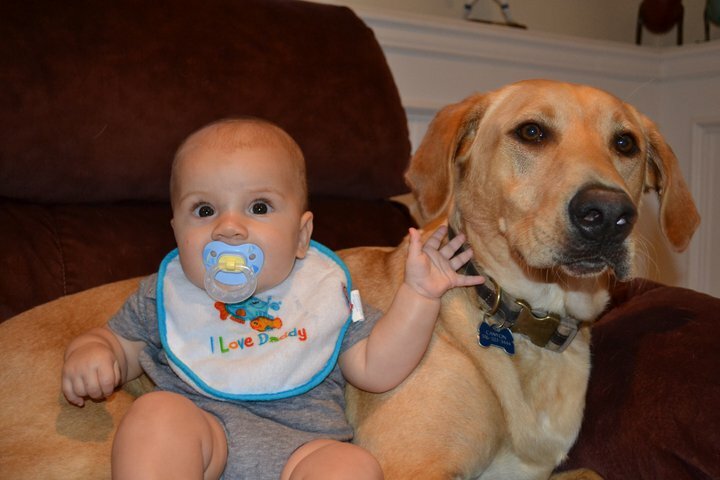 Hudson is now 9 moths old and you can see the bond they have started. Canyon is great with the baby! Canyon loves the water and going for boat rides. We could not have asked for a better dog! Thank you!! bigger than her! We cannot wait to come back and add to our family. been the best thing to happen to us! Janna, Josh, Kaleb and Barrett! this picture but she is much smaller than B. 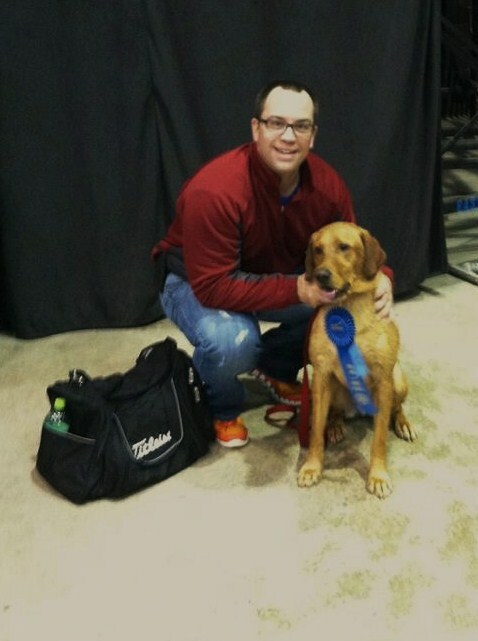 .Kenworth took first place in his heat class at the Dock Dog competition at the Bismarck Sports Show. Thanks for the great dog and training. Thought you would enjoy seeing what great pals Moxi and Evie are. Evie is doing better still a few potty training issues but over all a very good girl. We love her lots. 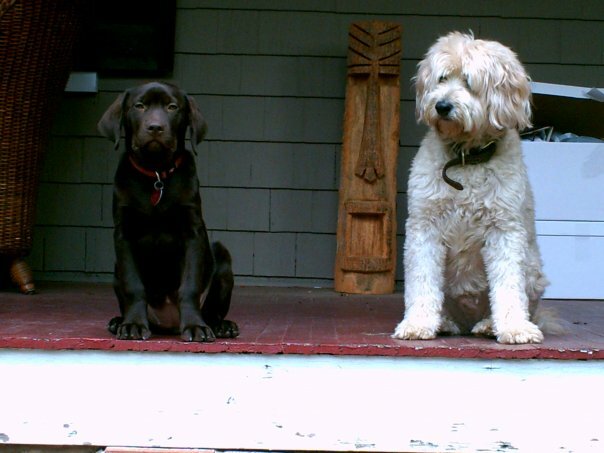 Moxi was from Sadie and Loui. She was a year in Oct.
She's already seen hundreds of miles of trail and field time! 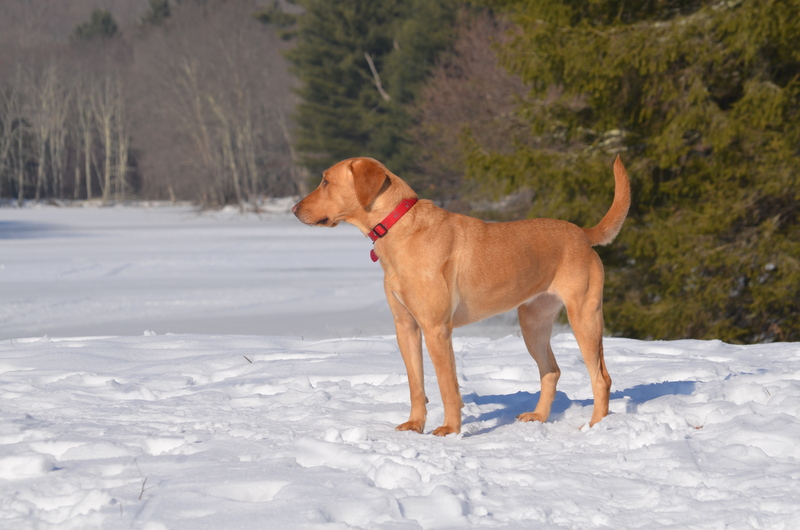 I am writing to you to tell you thank you so much for my wonderful Lab, Dakota. 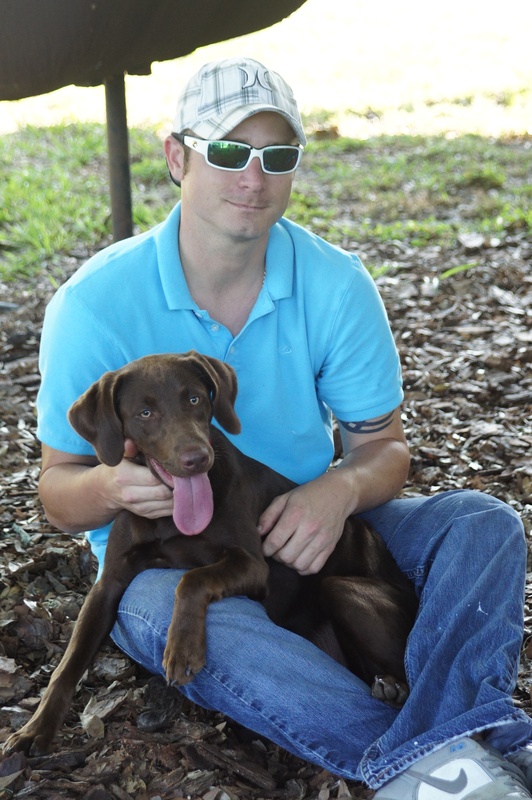 Chuck brought Dakota down to Houston, TX to me 3 years ago this month now. She was my birthday present from me, to me. 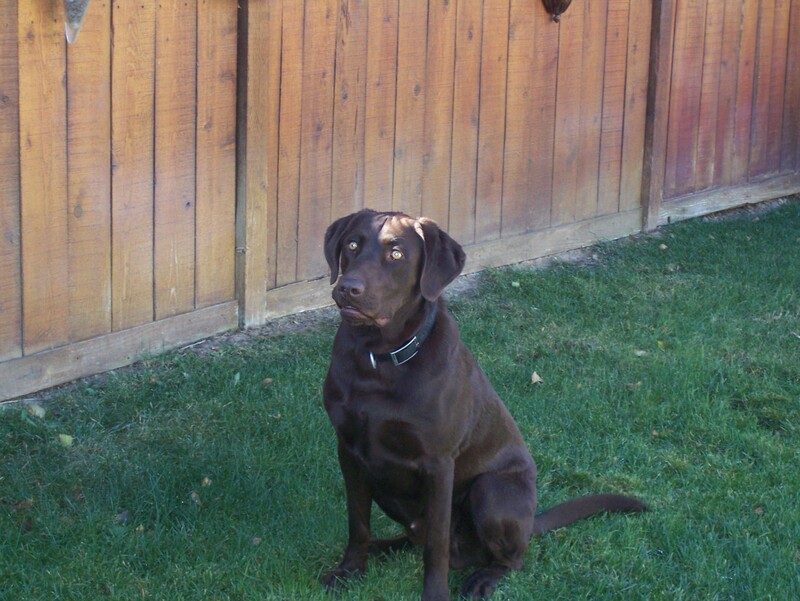 (Time has flown) She is such a great all around dog. Her disposition and mannerisms have made her such a joy to be around. 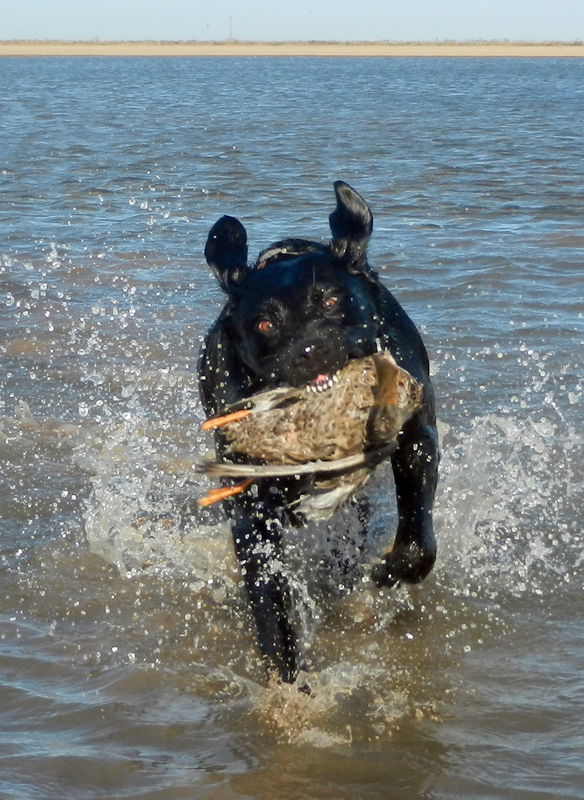 Being such a great bird dog like she is it is hard to keep her out of the water. (Go-figure - hehe) Which is fine as being outdoors is a great place to me. She is such an extremely smart dog and I just wanted to tell you, she has brought me so much pleasure and happiness in my life. Thank you so much. Attached are a few pictures. 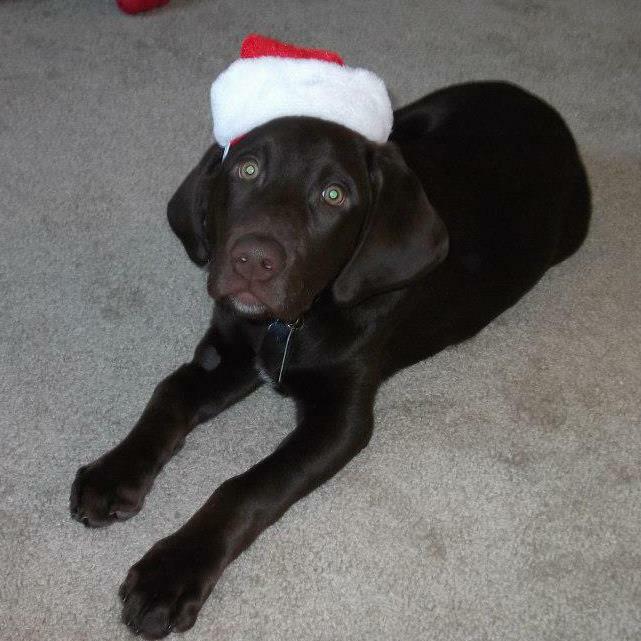 Here is the most recent picture of Gunner. He is growing so fast!! Ashley, Bryan and Gunner H.
Just wanted to say thank you for working with Dakota this fall. 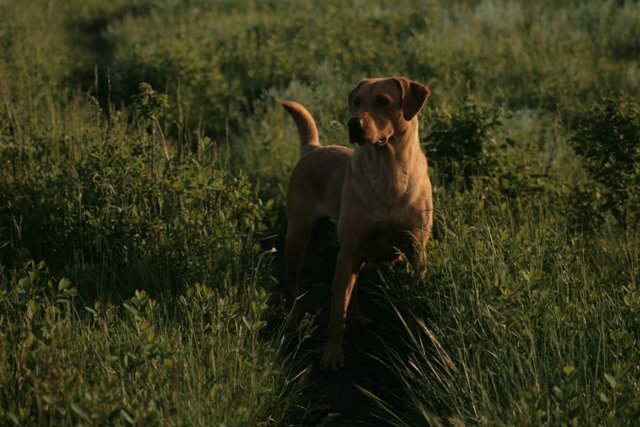 she is doing very good she has been bird hunting in South Dakota and here in Wyoming. 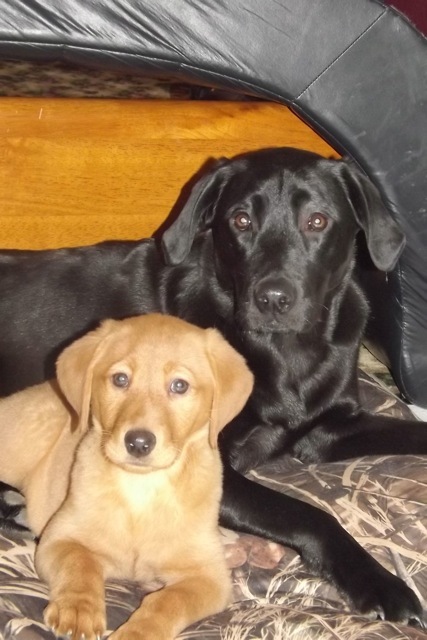 And as for Gunner (Red lab puppy) we baught when we picked up Dakota, he is growing and keeping Dakota on the go ! We are enjoying both dogs, thanks ! Heather I was not able to find Dakotas papers can you get me a new set ? I can send you the 20 $. Thanks so much! Here are a few pictures of Joe from the first week we had him. scared, but doing well with the other dogs. The cat is intrigued by her. Heather. This is the greatest pet ever!.. Millie is smart and easy to train. Take a look at her latest photo's. 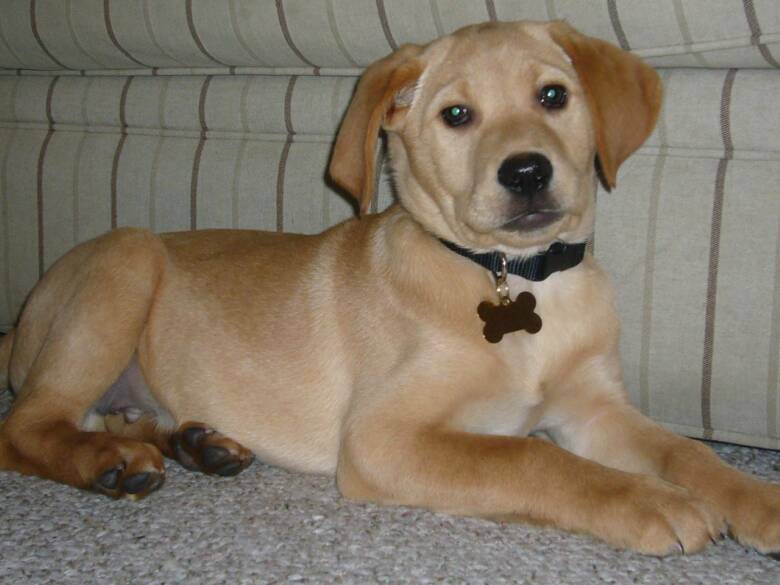 If you dont remember me, my name is Chris Clemens and you brought a silver lab pup to me up in Minot. Rocky, (Steel & Silver) is now 7 months and one heck of a dog. He's is 75 lbs and growing. He has a personality like I have never seen before in a dog. Its almost like he is a comedian at times. I will try and get a better pic of him this weekend. Ive looked at his parents on your site, he looks a lot like his dad the way he stands out in the sunlight. He is a damn good looking dog and I have recieved many compliments on him. The yellow is my other dog I got in Williston from my uncles batch. They are 3 days apart, she weighs about 45. The young pics are about a week after you dropped him off. The rest are from their first hunt this last Mon-Wed. They did pretty good for as young as they are and being out the first time. The other day he stuck his head down into the bottom of the garbage can and pulled out an empty bottle of Jack Daniels. I just wanted to let you know our puppy that we received in November 2015 is a great dog!! We have named him Gauge. He has the most amazing disposition and is a very quick learner. He is crate trained, house broken, and well started on obedience. When we are ready for another one we will definitely be contacting you.